You are here: Home / News / Get your Thanksgiving gifts from KeepCalling! 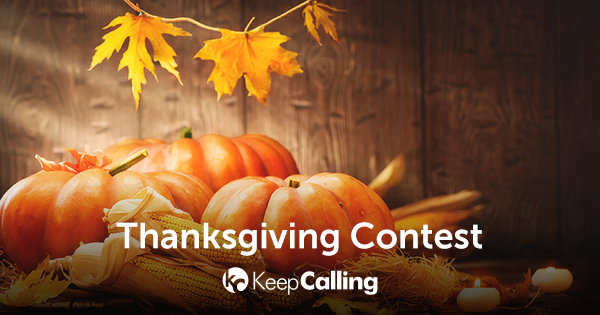 Get your Thanksgiving gifts from KeepCalling! On Thanksgiving we think about all the reasons to be grateful for in our lives. We celebrate the blessings of the year, including those that go right to your heart. Family and friends, love and peace are just a few that come to our minds in this very instant. Times of great joy are coming, so Happy Thanksgiving from our family to yours! KeepCalling has thought of the perfect gift for you. We’re helping you call to say how much you care. Here is 10% Voice Credit Bonus, for you to enjoy some quality time on the phone with your loved ones. This offer is valid for Voice Credit orders of minimum $20 placed until November 22, 2018 (23:59 EST), using coupon code: TIME2THANK. Keeping in touch with your family and friends is so much easier with the help of KeepCalling! Can you handle more gifts? Of course you can :). Keep an eye on our Facebook page for a Thanksgiving CONTEST. You’ll have the chance to win a $10 Voice Credit prize. So, don’t worry, talking is on us this holiday. Happy Thanksgiving! What people ate at the first Thanksgiving? Of course it’s a time to give, to love and to reflect on things that matter the most in life, but, let’s face it, it’s also a time for eating. The first Thanksgiving meal probably had little in common with today’s traditional food. Although turkeys were indigenous, there’s no record of a big roasted bird at this feast. The meal included deer and lots of local seafood (mussels, lobster, bass) plus the fruits of the first pilgrim harvest, including pumpkin. Nope, no mashed potatoes. They had only been recently shipped back to Europe from South America. Expat communities in the US Get the holiday season started with some rate decreases!